Growing numbers of people are avoiding wheat and other grains because of celiac disease. Gluten seems to be the food ingredient non grata these days. Bakers are coming up with recipes for gluten-free cupcakes and baguettes. Anheuser-Busch sells Redbridge, a gluten-free beer made from sorghum. And, of course, times being what they are, you can easily slip into an Internet swirl of blogs and Twittering about gluten-free foods. It's not just talk: cash registers are ringing. By some estimates, the sales of gluten-free foods have tripled since 2004. Gluten-free food has become more popular partly because doctors are diagnosing more cases of celiac disease, an autoimmune disorder whose symptoms are triggered by gluten, the protein content in wheat, barley, rye, and spelt (an ancient form of wheat that's catching on as a health food). Celiac specialists say the disease isn't diagnosed as often as it should be. As a result, many people suffer with it for years, often after getting other — and incorrect — diagnoses and useless treatments. But a growing number of the people dodging gluten fall into a gray area: they don't have celiac disease but seem to be unable to digest gluten properly. There are no tests or strict criteria for this problem, aside from simple trial and error with a gluten-free diet. Often people self-diagnose. It's hard to know what's going on. Some people may be getting caught up in a food fad. But many others probably do have a real problem digesting gluten or perhaps the sugars in some of these grains, a condition akin to the lactose intolerance that makes it hard for many people to digest dairy foods. Their problem is not as well-defined or well-understood as celiac disease but they have a problem nonetheless. There's a third group of gluten-free converts: people who are blaming gluten for a wide range of medical conditions, not just gastrointestinal distress. For example, there's a fairly loud Internet "buzz" about autistic children improving once they're on a gluten-free diet. There's good, solid evidence of an overlap between celiac disease and other autoimmune disorders, particularly type 1 diabetes. And celiac disease and other autoimmune disorders sometimes have neurological effects — peripheral neuropathy, for example, which involves nerve damage that results in numbness and pain. But based on what is currently known, it's a big leap to attributing autism and other problems to gluten, and an even bigger one to prescribing gluten-free eating as a treatment. It's possible that some people benefit from a gluten-free regimen for reasons that have less to do with gluten and much more to do with the structure involved in planning and sticking to such a strict eating plan. Gluten is an imprecise term that shifts meaning depending on the context. Gluten comes, not surprisingly, from the Latin word for glue, and cookbooks define it as the protein-based substance that makes dough resilient and stretchy. If you're making bread, you want gluten in the dough, so that when it's baking the walls of the little air pockets formed by yeast expand but don't burst open. But if you're making cookies or a pie crust, you want to keep the gluten content of the dough and batter low. Otherwise, your results will be tough and gummy. In the context of celiac disease, gluten refers to the protein of grains capable of provoking an autoimmune response. Other grains also contain protein, but wheat, barley, rye, and spelt contain varieties that aren't broken down by digestive enzymes. In wheat, the difficult-to-digest protein is gliadin; in rye, it's secalin; and in barley, hordein. These proteins don't faze the guts of most of us. 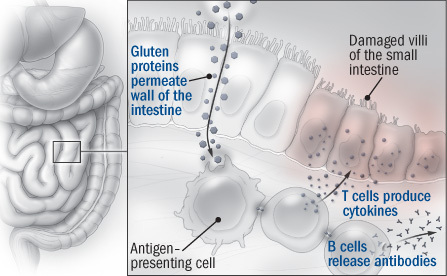 But in people with celiac disease, when they get absorbed into the walls of the small intestine, the immune system misreads the situation, views them as intruders, and unleashes a furious inflammatory response that damages tissue (see illustration). The inside of a normal, healthy small intestine is carpeted with millions of fingerlike projections called villi that produce digestive enzymes and soak up nutrients. The misguided immune response triggered by the gluten proteins sometimes attacks these villi, so they lose their slender shape and become short and stubby, even flat. When that happens, the villi produce fewer digestive enzymes and absorb fewer nutrients. The classic and most immediately noticeable symptoms of celiac disease are, not surprisingly, gastrointestinal: bloating, flatulence, and diarrhea, sometimes with smelly stools. People who can't digest gluten or grain sugars may have similar symptoms. Celiac disease can severely impair the absorption of nutrients. In children, this may lead to stunted growth; in adults, the consequences include anemia (because iron isn't being absorbed) and weaker bones (because calcium and vitamin D aren't getting into the body). Anemia causes fatigue and malaise, but some people with celiac disease feel that way without anemia. Doctors sometimes miss the celiac disease diagnosis because they're looking for the classic gastrointestinal symptoms, not the vaguer ones that stem for the most part from malabsorption of nutrients. One major difference between celiac disease and grain-related digestion problems is that when it's just a digestion problem it typically doesn't lead to malabsorption and nutritional deficiencies. Women with untreated celiac disease have higher-than-normal rates of menstrual abnormalities and infertility. A large study published in 2007 found an increased risk of pancreatitis in people with celiac disease. It's not clear whether a cause-and-effect relationship can be inferred from these associations or if celiac disease and these conditions happen to be consequences of a shared, common cause. According to some research, several of the nongastrointestinal conditions associated with celiac disease might be caused by an overabundance of antibodies that the immune system churns out, especially those it produces in response to an enzyme in the small intestine called tissue transglutaminase. The antibodies travel to other parts of the body through the bloodstream. Perhaps the clearest example of one of these antibody-related symptoms is a skin condition, dermatitis herpetiformis, which causes itchy red bumps. Less certain is whether the anti–tissue transglutaminase antibodies might get into the brain and cause neurological problems, such as loss of muscle control (ataxia). Compared with other autoimmune disorders (such as Crohn's disease and rheumatoid arthritis), the diagnosis of celiac disease is pretty straightforward. In the United States, the issue has been getting doctors to consider the celiac diagnosis as a possibility. That's changing. For example, the guidelines for irritable bowel syndrome were revised to include testing for celiac disease. The diagnosis begins with a blood test for the antibodies generated by the immune response that gluten provokes. Tests exist for several different types of antibodies, but the one for the antibodies against the tissue transglutaminase enzyme is the most reliable and accurate. If the blood test is positive, the next step is biopsy of tissue from the small intestine to see if the villi have been damaged. Collecting the biopsy involves snaking an endoscope — a flexible tube with a tiny camera on the tip — down the throat and through the digestive tract and snipping out small pieces of tissue that can be examined under a microscope. Dr. Daniel Leffler, a celiac disease expert at Harvard-affiliated Beth Israel Deaconess Medical Center in Boston, says the biopsies show, on average, that over 90% of people with positive antibody tests and celiac symptoms have intestinal damage, and the presumption is that they have celiac disease. But if the biopsy shows a lack of intestinal damage, that usually rules out celiac disease as a diagnosis. In people with symptoms, judging whether there's a favorable response to a gluten-free diet isn't difficult: the turnaround from illness to health can be quite dramatic. But Dr. Leffler notes that many — indeed, perhaps most — people with a positive antibody test and intestinal damage do not have symptoms or have atypical ones that are subtle and vague. These patients raise some important questions. Is this a case of test results in need of a disease, rather than the other way around? And from the patient's perspective, why bother with a diet that's inconvenient — despite the growing number of choices — and expensive if you don't have symptoms? Celiac disease experts have a three-part answer. First, if doctors and patients were more aware that problems like anemia and fatigue can be traced back to celiac disease, they'd see that a gluten-free diet improves these symptoms. Second, if symptoms are subtle, so might be the improvement. Third, like many so-called silent diseases, celiac disease may not have showy symptoms, but if left alone, it may result in serious problems down the line related to poor nutrition. And some data suggest that the risk of developing other autoimmune conditions (including thyroid disorders like Hashimoto's thyroiditis and Graves' disease) may be related to how long someone with celiac disease has been eating gluten. We're often too quick to depend on pills instead of first working to change our diet and exercise habits. But with celiac disease, there's no pill, and a fairly radical change in diet is the only treatment. Ironically, doctors who treat celiac disease lament the lack of pharmaceutical industry involvement. Drug companies have started to take some interest in the disease, and treatments that would block the absorption of gluten are being investigated, but none so far are close to gaining FDA approval. Gluten-free eating is a two-way street: getting the gluten out while bringing in healthful — and palatable — alternatives. Some foods are obviously made with wheat and the other gluten-containing grains. Conventional bread, bagels, pizza — they're out if you have celiac disease. But until you need to avoid gluten, you probably don't realize how ubiquitous it is. Gluten is used as a thickening agent and filler in everything from ketchup to ice cream. The inactive ingredients in many medications are gluten-based. And even when gluten isn't an ingredient, it may inadvertently get into a food because a wheat-based food was processed in the same factory, or wheat was grown in a nearby farm field. At home, wooden utensils and toaster ovens are gluten "hot spots." Oats don't contain gluten, but many people with celiac disease avoid them because of contamination problems. The gluten-free diet has traditionally depended on starch from rice, corn, and potatoes. Food makers have also learned how to use xanthan and guar gums to replace gluten's elasticity: a common complaint about gluten-free baked goods is that they are powdery. But these formulations can also leave diets short of fiber and B vitamins. Melinda Dennis, the nutrition coordinator at the Beth Israel Deaconess Medical Center Celiac Center, encourages patients to eat foods made with unconventional but nutritionally well-rounded substitutes, including amaranth, buckwheat (no relation to wheat), millet, quinoa, sorghum, and teff. She calls them the "super six" because of their high vitamin and fiber content. Eating out is one of the biggest issues for people with gluten problems, says Dennis. Vegetables get contaminated because they are steamed over pots of pasta water. Fish and chicken are floured to hold seasonings. But many restaurants are beginning to offer gluten-free items. And there are some celiac-friendly cuisines, even if they are not overtly gluten-free. Dennis put Ethiopian (which uses teff), Indian, Mexican, and Thai in that category. Is it a food intolerance, allergy, or something else?